It’s official – December is here and we can finally start talking about Christmas without adopting a hushed tone and checking over our shoulder to make sure the Grinch isn’t nearby. With the days becoming ever colder and darker, we’re dreaming of wrapping our chilly fingers around a steaming hot mug of mulled wine. Not the over-boiled, sickly-sweet sort you’ll find served out of snow-topped sheds at Christmas markets up and down the country, but the proper, home-made, spiced punch that could warm up Ebenezer Scrooge himself. Finding the perfect recipe isn’t easy – everyone has a different idea of exactly which spices to use, but we’re sure that if you follow a few simple rules you’ll end up with a delicious mulled wine that will have you glowing with Christmas spirit in no time. Our favourite part! There are a couple points to remember when choosing your wine for mulling – mainly don’t buy anything too pricey as strong spices will cover the complexities of the more expensive stuff. Most recipes recommend choosing something bold, fruity, and preferably unoaked. Delia Smith favours a Bulgarian Cabernet Sauvignon while Jamie Oliver prefers a Chianti, but Mary Berry doesn’t have a preference. Find out how to create the perfect Christmas punch? We’ve picked five of our favourites which we reckon will do the job. This almost black red from Portugal has bags of intense forest fruit flavours with a hint of cinnamon making it a bold enough wine to stand up to lots of fragrant spices. It’s also got heaps of praise, having won five golds, a Best Buy and 90 points from Wine Enthusiast over two vintages . Packed with spiced plum and raspberry flavours, this rich, dark red has bagged 50 awards in the last seven vintages, while the winery has twice been voted southern Italy’s finest. With more 500 five-star reviews, it’s a customer top favourite. This rich red wine needs very little introduction, it already has an illustrious medal-winning history. We think its deep plum and prune flavours with hints of sweet spices and herbs make it an excellent option for mulling. This big, smooth red is a regular Top 10 favourite among our customers. Packed full of spicy black fruit flavours, El Bombero will definitely stand up to any number of flavours you throw at it when making mulled wine. This super-juicy Shiraz sums up all that we love about Aussie wine. Year after year Willy Willy (the name is Aboriginal for the dust storms that occasionally whip through the vineyards) is one of our best-selling Australian reds due to its deep spiced plum and blackcurrant flavours – perfect for pairing with strong spices. This is where recipes can vary quite drastically. A classic mulled wine will include oranges, cloves and cinnamon, but you can also add lemons, limes, vanilla, nutmeg, cardamom and star anise. Some people even swear that adding a couple of tea bags is the secret ingredient in their family recipes. The biggest decision to make is whether you will cook all the spices in with your wine, or make a syrup first. As you can imagine, Delia and Mary keep things very simple, simmering all of the spices and a few tablespoons of sugar with the wine. However, Jamie says making a syrup first (by boiling the spices and sugar with a splash of wine) is the best way to go. He claims as it adds a wonderful flavour, and minimises the amount of alcohol which is burned off in the cooking process. To save you the hassle we’ve got a gourmet mulled wine syrup which you can just add to your wine and heat up. However, if you’re making your own we’d recommend using white caster sugar above anything else. Honey and soft sugars are too strong of a flavour. 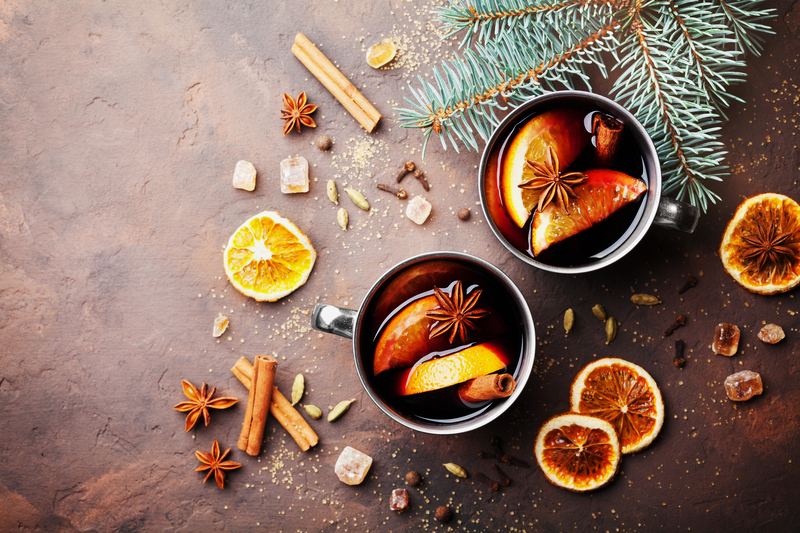 Vodka-laced Glogg, rum, gin or brandy – what will you add to your mulled wine? Once you wine has simmered gently for around 20 minutes it’s time to serve, but not before you add one final extra flourish. Delia recommends a splash of fruit liqueur such as Cointreau or Grand Marnier while Mary Berry suggests a drop of brandy. If you’re feeling really brave you could follow the Swedes and add a touch of vodka to turn your mulled wine into Glögg. However we reckon a spiced rum or a sloe gin would give your mulled wine the extra kick it needs. Made on a family farm in Herefordshire, Chase vodka is taking the world by storm. This British spirit is great served neat, but we suggest adding a couple of measures to liven up your mulled wine a bit! Named the world’s best rum, this double Gold medal-winner is part of the Caribbean collection produced by Cognac Ferrand. It goes through a special double maturation – ageing in bourbon casks in Barbados, then in Cognac barrels in France – which is bound to add extra luxury to your mulled wine. If you fancy a glug of brandy in your mulled wine, you can’t go far wrong with this warming Cognac. The Frapin family have been honing their craft at Château Fontpinot in Segonzac for nearly 800 years and this one is their classic house style. To add a real ruby glow to your mulled wine, we heartily recommend this sloe gin. Made by steeping hand-picked Dartmoor sloe berries in Sipsmith’s famous London Dry Gin, it will add heaps of winter berry warmth to any drink. Now you’ve got all the knowledge you need to create a great batch of mulled wine, we’d love to know how you get on. Why not get in touch on social media to show us your warming punches. You can send your photos on Facebook, Twitter or Instagram. Cheers! For more on Christmas at Laithwaite’s Wine head over to our blog homepage where you’ll find everything you need to know about choosing the perfect Christmas gift and our festive wine tasting event.